High Contrast’s tickets are on sale for his debut headline live show ‘High Contrast Live’, which will take place at Electric Brixton on 18 March. The gig follows his debut live performance at Together Halloween at O2 Academy Brixton in October. 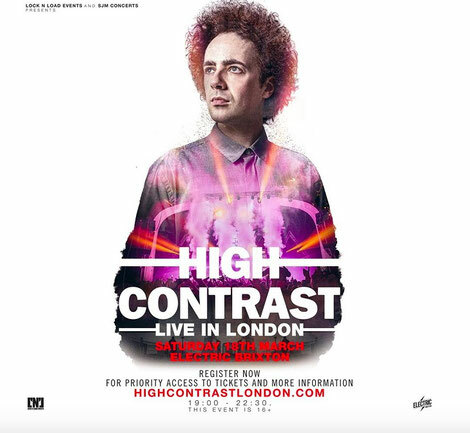 ‘High Contrast Live’ will feature new material from his forthcoming album, alongside classic productions in a state of the art production set-up. The High Contrast gig is open to 14+ year olds, with under-16s required to be accompanied by an adult. Recently premiered by Radio 1, High Contrast’s ‘Shotgun Mouthwash’ is the next track to be revealed from the British electronic music artist’s forthcoming artist album. A key part of the soundtrack to ‘T2: Trainspotting’, the riff-heavy stomp of ’Shotgun Mouthwash’ takes its cues from bluesy rock and roll and features High Contrast on vocals, lead and bass guitar, keys, and drums. While Lincoln Barrett, the man behind the moniker, is a respected electronic music artist, the sound of ‘Shotgun Mouthwash’ won’t surprise those who’ve heard his sound evolve over the course of five previous studio albums. Though most well-known as a figure within D&B, an eagerness to explore different genres has seen him incorporate rock, Northern Soul, film soundtracks (Lincoln is a former film student and film obsessive), hip hop and beyond, into his music. The inclusion of this track in ‘T2: Trainspotting’ marks the second time he’s worked with director Danny Boyle. His involvement with Underworld on a collaboration for their 2010 album, ‘Barking’, led to Barrett, alongside the duo and Boyle, programming the music for the athletes opening parade at the 2012 London Olympics – a “surreal experience” that saw him reach an audience of over 1 billion people. Lincoln also produced Underworld’s 2016 album, ‘Barbara, Barbara, We Have A Shining Future’.